In January my Columbia colleague Jeffrey Sachs told me that the Pontifical Academy of Social Sciences (with which he had worked for several years) was organizing a conference at the Vatican of judges, prosecutors and legal scholars from around the world to discuss how the law can address the scourge of human trafficking, and that Pope Francis would attend. He asked my help in identifying some individuals who should be invited, and I was happy to help. On the first morning of the conference, I joined other dark-suited men and women in their 50s and older in boarding a bus at the hotel. After we passed through a side entrance to Vatican City, we traversed narrow tree-lined streets (passing numerous priests in long robes walking to work) and parked at Casina Pio IV, which was completed in 1562 as the summer residence of Pope Pius IV. The dome of St. Peter’s Basilica loomed behind. Inside was a conference hall with rows of benches and desks; each desk had a plaque with the name of the person assigned to sit there, a headset for simultaneous translations in several languages, and a microphone that was remotely switched on when it was time to speak. A bust of Pope John Paul II sat above the podium. Throughout the building were original paintings and sculptures, and many of the ceilings had frescoes from the 16th century. Our meals were served in an outdoor elliptical courtyard. The buffet featured, along with less surprising fare, many plates of matzo. The program was opened by Monsignor Sorondo, and then chaired by Valeria Mazza, an Argentinian supermodel from the 1990s and 2000s who did an excellent job of keeping all the speakers to 15 minutes. The speakers were judges and prosecutors from around the world (including several U.S. federal district court and court of appeals judges) and a few academics like Jeff Sachs and myself. Human trafficking is defined as the illegal trade of humans, usually for sexual exploitation or forced labor; Jeff reminded us that Joseph had been sold into slavery and thus was a victim of human trafficking. He and others were happy to report that the Sustainable Development Goals that were adopted by the United Nations General Assembly last September included a call to end modern slavery and human trafficking. Many of the judges told stories of the horrific cases of trafficking they had handled in their courtrooms. Often unsuspecting young people were tricked or coerced into prostitution, forced labor, drug running, or other degrading, illegal or dangerous activities. Organ trafficking is distressingly common in some parts of the world. In many countries only a fraction of the necessary government resources are available to investigate and prosecute these cases. One clear message was that the perpetrators of this trafficking should be the ones who receive the greatest punishment, not the victims. Another is that government corruption, often incited by organized crime of various sorts, is typically involved whenever large-scale trafficking occurs. About two hours before the Pope’s scheduled arrival at the meeting, several large men appeared in and outside the room wearing wires going into their ears. About five minutes before schedule, I heard someone say “he’s here!”. A door opened in front of the room, and Pope Francis walked in, wearing his white cassock and skull cap. He took a seat at the head table. Everyone in the room stood and applauded, and many took out their phones and cameras and started taking pictures. After his talk, all were invited to join the Pope in front of the building for a joint photo. A swarm of photographers was waiting outside. After the photos, the Pope shook the hands of many of the participants, including myself, and gave each of us a friendly gaze and a warm smile. He posed for several selfies. He was jostled around a fair amount by those seeking to say a few words with him, but he seemed to enjoy the scene; indeed his whole demeanor was one of a person who believes strongly that he is doing important work, and takes joy in doing it. Finally he climbed into a small sedan, sat in the front seat, and waved as he was driven away. Michael Gerrard’s talk, “Climate Change and Human Trafficking After the Paris Climate Agreement“. 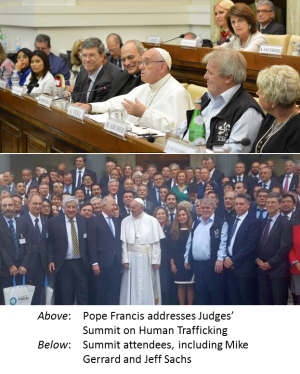 Pope Francis’ remarks to the Judges’ Summit.